Social workers say many women offenders are actually victims all along, before the crime is committed, during the period of imprisonment, and even after release. Sister Clara (left) and Sister Fidelis outside their ashram. On the outskirts of Bengaluru, in Doddakannalli, an ashram embodies the root meaning of the word in a very special way. The word ‘ashram’ comes from the Sanskrit root ‘sram’, which means ‘to toil’. At Jeevodaya Ashram, the women who stay there are shedding new light on that term. Recently released from jail, they are toiling to rebuild their entire lives. 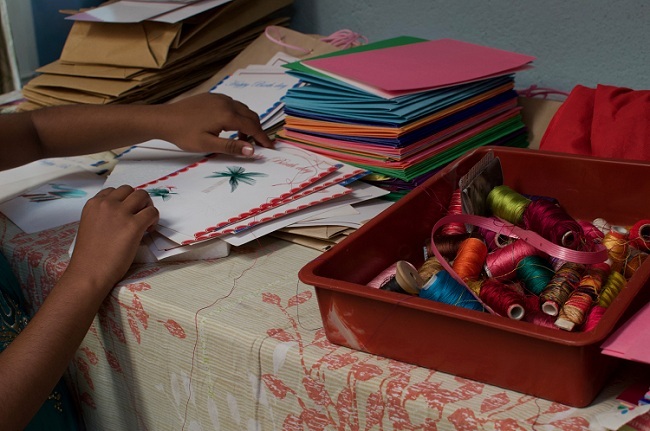 The materials, women at the ashram use, to make greeting cards and bags. Speaking on the condition of anonymity, three women out of the thousands shared their stories. These women had found their way to the ashram because they met Sister Fidelis and Sister Clara in jail. In June 2018, the Ministry of Women and Child Development (WCD) published a report proposing 134 recommendations to improve the lives of women who are in jail. In the study conducted by WCD Ministry, it was found that in many cases, women were abandoned by their families and were left to fend for themselves after their release. The report proposes a comprehensive after-care programme to be put in place, covering employment, financial support, regaining of child custody, shelter, counselling and continuity of healthcare services. However, many states lack the basics in care. According to the Commonwealth Human Rights Initiative, an independent, international non-governmental organisation, the prison visiting system in India is "dismal." Their 2016 report 'Looking into the Haze, a Study on Prison Monitoring in India', showed that only one state, Meghalaya, was complying with the laws that dictate how and when prisons should be visited. The study explains that an official Board of Visitors (BOV) needs to be in place to ensure basic health and safety of the women, but very few states are implementing this. Cecilia Davies, an independent consultant who has worked on criminal justice issues for years, says, "A glimpse into the lives of women who are incarcerated will more often than not reveal a history of neglect, discrimination, abuse and subjection to violence in its various forms and at its worst. However, what is saddening is that once they are convicted of a crime, they are considered better off forgotten and erased from the memory of their families. Their ordeal worsens post their release with no one to reach out to and nowhere to go. The irony with women offenders is that despite being convicted, they are actually victims all along, before the crime is committed, during the period of their imprisonment and even after they are released. Respite is simply elusive as far as many of them are concerned." "In all her simplicity, a woman-convict once told me – ‘Madam, I used to be beaten and spat upon every day. I cannot even dare recall what I went through behind the four walls of my house. One fine day, I defended myself and my husband died. I never intended it, but that day I could not take it anymore. I fought back. I thought the judge will understand what happened with me. Where is the justice, for all that I faced through all the years with my husband? Who is to be punished for that? It feels like I was punished for fighting back’."